A new fun-filled Hot Rod Hamster reader from the dynamic duo of Newbery Honor author Cynthia Lord and NEW YORK TIMES bestselling illustrator Derek Anderson! Hot Rod Hamster is looking for adventure! 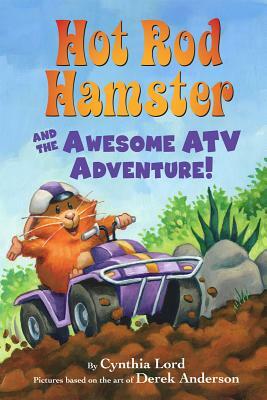 Hamster and his friends go looking for an awesome adventure at Al's ATV Park. But Hamster needs YOUR help to make it the perfect ride, full of bumps, jumps, and down-and-dirty fun! After roaring up hills, rolling over rocks, and splashing through mud puddles, the group halts at the sound of one word: "Help!" A family out for a picnic has gotten their ATV stuck in the mud! So Hamster and his friends stage a down-and-dirty rescue, proving that great adventure--and great new friends--come in all sizes! Newbery Honor-winning author Cynthia Lord and New York Times bestselling illustrator Derek Anderson's beloved characters return. With the same bouncing rhythms, fun choices, and daredevil antics that make the acclaimed picture books sparkle, these Level 2 readers will be a sturdy stepping-stone for Hot Rod Hamster fans and series newcomers alike as they move on to independent reading. Derek Anderson is the NEW YORK TIMES bestselling illustrator of the Little Quack series by Lauren Thompson as well as the Hot Rod Hamster series by Cynthia Lord. He is also the author and illustrator of STORY COUNTY: HERE WE COME! He writes and paints in Minneapolis, Minnesota. Visit him online at www.derekanderson.net.